Since antiquity whey has been known as “healing water” by Greek physicians. 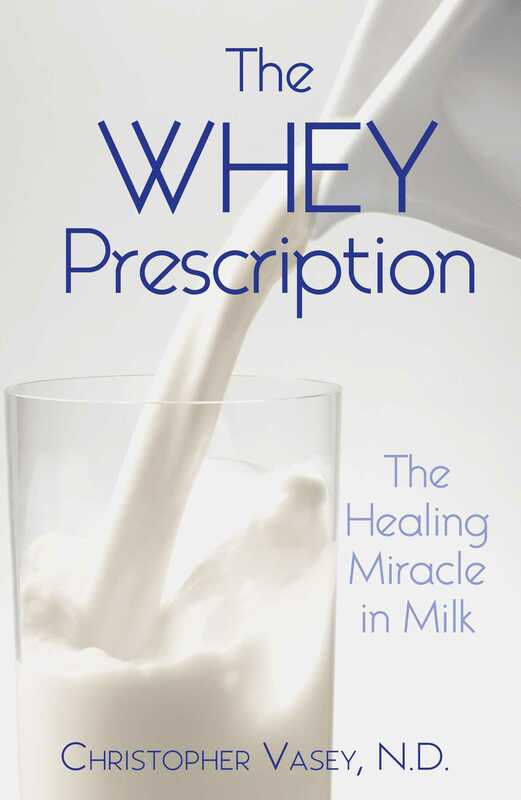 Hippocrates and Galen both recommended whey to their patients. In the eighteenth and nineteenth centuries, spas across Europe offered the whey cure to aristocrats and commoners alike. Modern scientific research has confirmed the curative capabilities attributed by our ancestors to this dairy product, but because it is highly perishable and must be consumed while very fresh, this cure fell out of favor in our modern urban age. Now, thanks to the availability of whey powder and granules, this highly nutritious and effective healing agent is once more within the reach of everyone. Whey is the watery part of milk that is separated from the curd in the process of making cheese. It is rich in lactose, minerals, and vitamins. Beyond its nutritional value, whey has powerful detoxification properties and its therapeutic action is beneficial for all the major organ centers of the body: heart, liver, kidneys, and intestines. It is especially effective in the treatment of liver ailments such as hepatitis as well as the treatment of skin problems, infections, edema, digestive disorders and gallstones, and the painful joint diseases of arthritis and rheumatism. Whey also has been shown to be a powerful treatment against obesity, high cholesterol, and high blood pressure. In addition to its ability to treat these specific illnesses, whey is a proven invigorating supplement that promotes overall good health and vitality. May your foods be your medicines. During the manufacture of cheese, milk is curdled by means of pressure. During this operation, milk coagulates and a hard part (casein) and a liquid part (whey, also called lactoserum) appear. Whey is therefore the liquid that escapes from the curd when it is left to drain. It is transparent, yellowish-green in color, and possesses a slightly tart flavor that is fairly pleasant. Whey can also be found in yogurt, which is another form of coagulated milk. The clear liquid that appears on the surface of yogurt when you take out a spoonful is whey. Raw, whole cow’s milk contains all the nutritional elements (proteins, vitamins, mineral salts, and so on) necessary for the growth of the baby calf. When this milk is curdled, these elements will be divided between the casein and the whey. The figures in the right column of the table below show what amounts of each substance remain in whey after the casein has been removed. This table is quite informative as it really allows the distinctive characteristics of whey to stand out. Indeed, whey is poor in fats and proteins after the curdling of the milk because these two substances primarily remain in the cheese. But it is the exact opposite regarding sugar (carbohydrates). Very little remains in the cheese and most of it can be found in the whey. While the protein content of whey is quite small, these proteins are of very high biological value. Furthermore, the sugar that is contained in whey is lactose, a very physiological sugar that the body finds quite easy to metabolize. The diseases that can be affected positively by whey cures are listed below. A short explanation of the causes of the disease is provided along with the manner in which whey can act on each of the disorders. This is by no means an exhaustive list because, as we have seen, thanks to its general action of correcting the body’s internal cellular environment, numerous other problems can be cured. Therefore only the principal indications are dealt with here. When it is not a result of overwork, lack of sleep, and/or stress, fatigue is often due to the fact the body cannot function freely because of the toxins that are clogging the system. By cleansing the blood and the system in general, whey contributes to the restoration of normal energy circulation. When the muscles are worked, acid wastes are produced that reduce both the body’s resistance and strength. Because whey encourages the elimination of acid through the kidneys, it allows athletes to increase the time they perform or work out and reduces the time necessary to recuperate afterward. Digestive problems (indigestion, gas, diarrhea) are often possible side effects to antibiotic treatments; antibiotics in fact destroy the bacteria of the intestinal flora. The lactose contained in whey allows this intestinal flora to rebuild itself more quickly and easily. These problems are often due to deficiencies in potassium and magnesium. This is something that the high content of potassium and other mineral salts in whey can easily remedy. Blood is the principal link in the chain of cardiovascular disorders. The wastes that it transports hinder its flow and become deposited on the walls of the vessels and the walls of the heart, blocking its passage to a greater extent as time goes by. The threefold purifying action (liver, kidneys, intestines) of whey helps blood to retain its purity and fluidity. Whey is an ideal food for a weight loss diet. It is a natural food that can be eaten on a daily basis. It is a dietetic food but still provides a small protein base, a light energy boost, and numerous mineral salts that permit the body to continue performing its necessary tasks. Furthermore, eaten half an hour before meals, whey will reduce the sensation of hunger. The causes that engender rheumatic disorders and diseases are always the same: the attack and creation of lesions in the joints by toxins, the depositing of toxins in the interspatial area of the joints, and the demineralization of the cartilage and bone by acids. The chronic nature of these problems stems from the chronic nature of their causes: poor diet and poor elimination. The detoxifying and mineral restoring properties of whey therefore contribute valuable assistance to the treatment of all these diseases. When an intestine is described as lazy it means that it only empties itself on an episodic basis and it does not evacuate all its contents; this occurs when intestinal peristalsis in insufficient. Peristalsis can be stimulated by the lactic acid and lactose that whey brings into the body. Whey has even proven effective at reeducating intestinal function among those people who have relied too heavily on the use of laxatives and purgatives to do what their bodies could no longer do. Christopher Vasey, N.D., is a naturopath specializing in detoxification and rejuvenation. He is the author of The Acid-Alkaline Diet for Optimum Health, The Naturopathic Way, The Water Prescription, The Whey Prescription, and The Detox Mono Diet. He lives near Montreux, Switzerland.